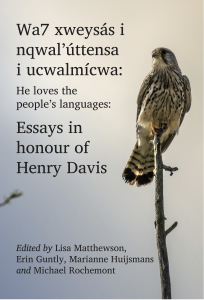 Wa7 xweysás i nqwal’úttensa i ucwalmícwa: He loves the people’s languages: Essays in honour of Henry Davis is a collection of essays inspired by the research and mentorship of Henry Davis. Much of the research is based on original fieldwork with many contributions focused on endangered languages of North America. The scope of the book is wide-ranging, covering topics from many subfields of linguistics, including syntax, morphology, phonology, phonetics, historical linguistics, acquisition, and narratives from the Pacific Northwest. As such, it will be of interest to a broad audience but especially to those doing fieldwork on languages of North America. Tax is included in the price. Please use non-Safari browsers to place your order in case an error occurs. Enter the address as it should appear on the shipping label.